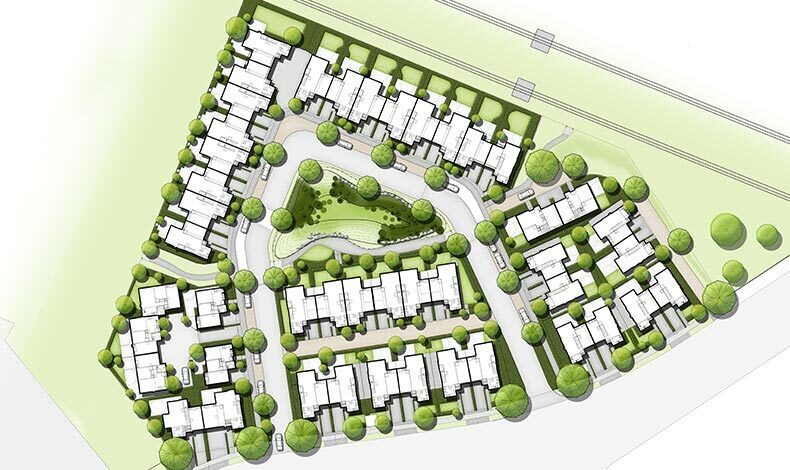 Boffa Miskell was commissioned by Enterprise Homes to provide masterplanning and urban design for their greenfield site in Hei Hei, Christchurch. Boffa Miskell’s services were practically sought to provide expertise around the development of higher density comprehensive housing, which is a new product for Enterprise Homes. The Vanguard Drive project was the first large project developed under the Canterbury Land Use Recovery Plan (LURP) and the Community Housing Redevelopment Mechanism (CHRM). These mechanisms were conceived to address the housing shortage in Christchurch, particularly for social housing providers who lost a significant portion of housing stock after the earthquakes. The LURP provides an opportunity to develop comprehensive, higher density housing, with one third social housing. Boffa Miskell established a partnership between the developer and Housing New Zealand to provide the social housing component of the scheme. Providing a logical layout, supported by a strong landscape framework.